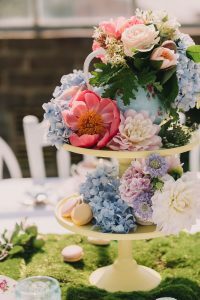 Earlier this year we collaborated with wedding planner & stylist Rachel Lu, from Bubbles & Bouquets, and a range of other amazing wedding vendors on an Alice in Wonderland themed photoshoot. We had a great day bringing all of our skills together to create a beautiful outcome that was perfectly captured by Kristie Carrick Photography and The Mountain Folk Films. Rachel contacted us to participate in this creative project and we jumped at the chance! She took inspiration from an all-time classic and childhood favorite- Alice in Wonderland. Together we all managed to channel the wonder, mystery, and craziness of the story into a fun, aesthetically enchanting wedding theme. We were so lucky to have perfect weather for the shoot, which added to the natural beauty of the waterside venue – Q Station. 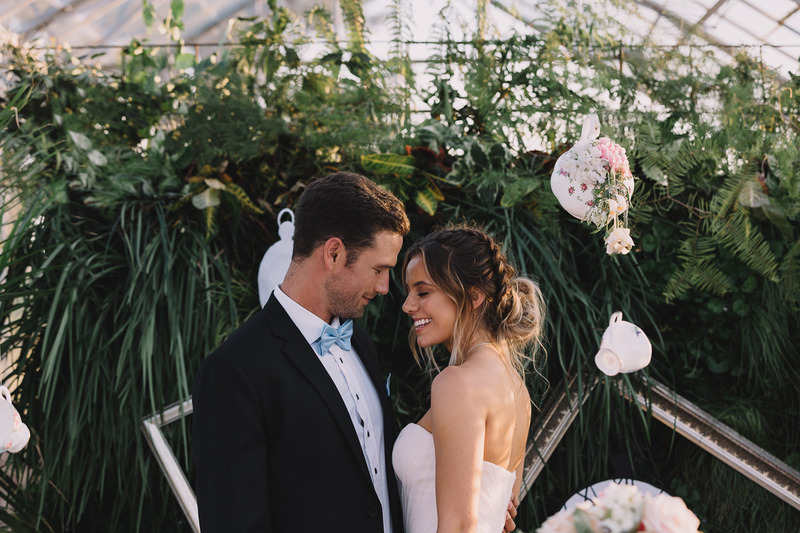 Every detail had been taken care of and thoughtfully tailored to the theme, from the flower arrangements by Wild Dahlia Florals, to the delicate stationery from Little Plum. We loved the whole set up, as it perfectly complimented the designs of our dresses. We created two dresses for the shoot, which was great fun. We really wanted to incorporate elements of the traditional Alice from the Lewis Carroll story into our more traditional design. It features cute cap sleeves, an A-line silhouette and of course the pale blue bow as a subtle nod to the original character. We went a little bit “mad” for the second dress and created a more whimsy look. 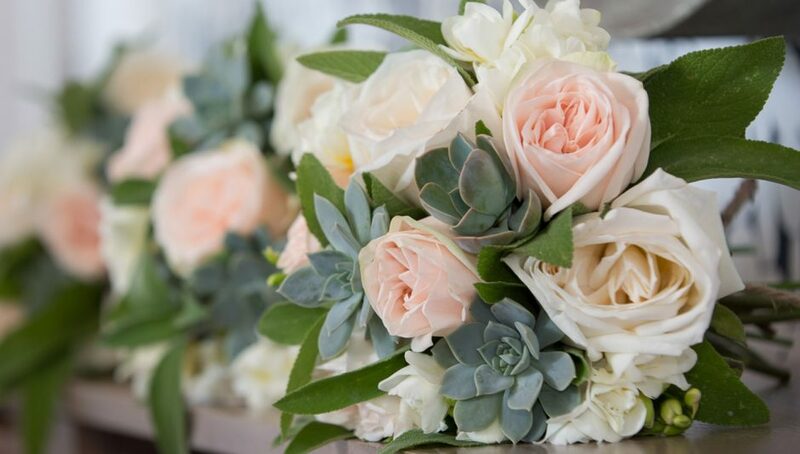 The strapless, pale pink design was elevated with 3D petals which added movement and texture. No wedding would be complete without cake and Cake From The Heart’s creation was no less than perfect for the event. 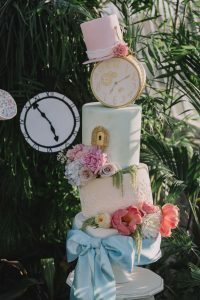 The five-tier topsy turvy cake featured the infamous gold clock, beautiful flowers and of course a big blue bow – we couldn’t wait to try a piece! It was great to be a part of the collaborative, creative process. Everyone that worked on this shoot was so talented. We have had lots positive feedback from this shoot and we even got featured in Polka Dot Bride! 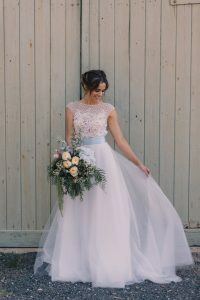 If you would like your wedding dress to reflect a particular style or theme, working with a bespoke wedding dress designer is a great way to ensure that you achieve the exact look that you want. Many designers love the opportunity to work on alternative designs and we are no different! From your first consultation, we can begin to create the dress of your dreams together!